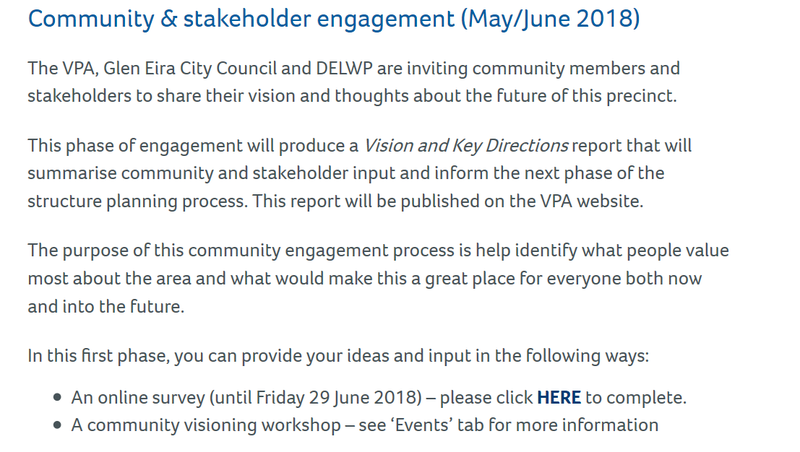 It would seem that the norm now for government and council is to fall back on meaningless jargon (ie ‘Vision’) and surveys that are highly questionable. Our view is that surveys are fine – but only AFTER residents know exactly what they are dealing with. What are the parameters that have been set? What is the proposed land use? Before any ‘survey’ results can be truly meaningful then residents need to know exactly what are the options? We fear that this process will simply mirror what has already happened with Bentleigh, Carnegie & Elsternwick – albeit on a much grander scale! Here’s part of the ‘survey’. We ask readers to consider its merit. My question is for the Minister for Planning. I raise an issue on behalf of 1300 local petition signatories who are outraged by the Elsternwick rezoning master plan, which will increase the local population by over 20 per cent with no consideration of the impacts on amenity, infrastructure and traffic congestion. Residents are also confused at the seemingly different rules for different electorates whereby the areas of Bentleigh and Carnegie are benefiting from interim height controls as low as four to five storeys whereas sections of Elsternwick have no current height limits and could face up to 20 –storey apartments complexes. The current Elsternwick rezoning plan is entirely inconsistent and incompatible with the local area. Can the minister provide an answer to concerned Elsternwick residents as to why are there are these inconsistencies whereby one electorate, the marginal seat of Bentleigh, is being benefited in comparison with another electorate, my electorate of Caulfield? The choices in the survey are useless. The focus is on the present, not the future. 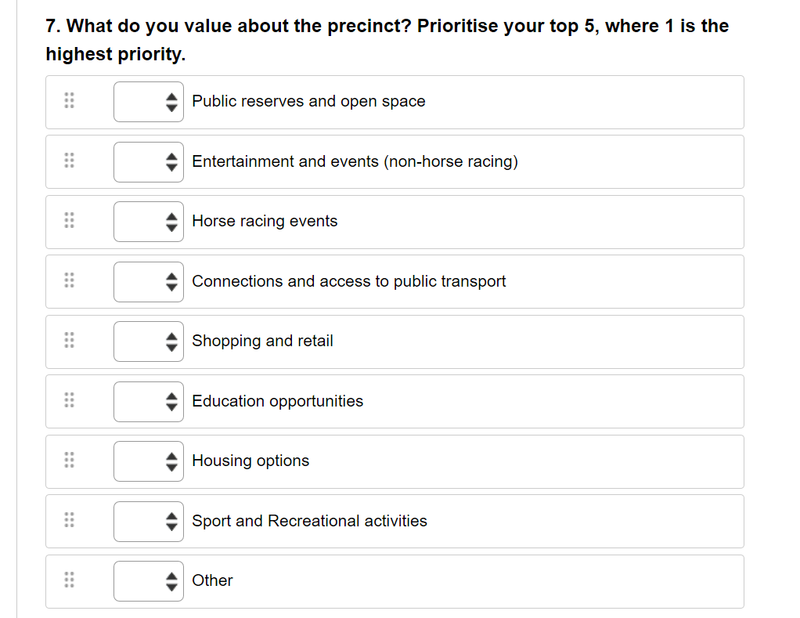 If I put “housing options” as a top priority how will this be interpreted? I’m satisfied with the mrc majority of one and two bedroom boxes? or that I want more student accommodation places? This leaves it all open for them to draw whatever conclusions they like to prove what they’ve already decided. Con job for sure. Another process which is just a smokescreen for a pre-determined outcome. More waisting of everyones time. Have a look at the disgrace that was the Elsternwick Structure Plan – no justification at all and not consistent with community feedback. How much valuable time has been waisted on this! Disgraceful. That’s an amazing lot of bull coming from Southwick he is just a political opportunist on every level, if he ever hits the truth now and again it’s only in his own self-interest, no one else’s. Please remember this is the man who ……..
A VICTORIAN MP whose official biography falsely claimed he was a university adjunct professor before being elected to State Parliament now says it was a misunderstanding. Liberal Caulfield MP David Southwick’s CV claimed he was an RMIT Adjunct Professor and a Monash University marketing diploma graduate. But both universities say he never held such titles and launched internal investigations into the matter. Of course Southwick’s remarks are in his own interest. That doesn’t mean they are wrong. Two universities have made it very clear there is no misunderstanding happening here. Are you advocating these types of misunderstanding that cast a shadow over every single person that have worked their hearts out and gained a diploma, degree or doctorate from Monash or RMIT, is actually OK if acting in self interest and therefore not wrong? He’s a politician so everything is in his self interest or the party. I’m not writing about students. My earlier comment was about his claim that Bentleigh might have got preferential treatment because it is a very marginal seat. That statement is in my view correct when compared to Carnegie and Elsternwick. Labor is not above self interest either. Sorry, that’s a very deflecting follow through,and sounds like your covering for a mate. Any statement can only ever be correct if it is genuinely trustworthy, if it’s just expediency talking, it can never be correct, in any context other than the expedient self interest is was delivered in. There is a moral component to using language written and spoken. So where does public interest fit into your view of political self interest? Here’s some ideas and statements I added to the Survey Monkey questionnaire. I have no idea if my efforts was successfully lodged, as I received no confirmation on screen or via email. Please keep the centre of this public recreational area as uncluttered. There is wildlife that uses the lake and surrounds, that needs considerations. Balance a relaxed welcoming place with naturally tree spaces on a human scale, against the greed of developers that just want to maximise their profits no matter what. Keep paved area to the minimum. Plant trees that have biodiversity values to this area, and not palms, that look good to overseas investors on a pamphlet. Make sure the project is as ecological sustainable as the latest tec. allows. No whiz-band silly gimmickry that will stop working as soon as the last apartment is sold, and be an eyesore from then on. Make sure the physical design will attract is a fair mix of residents of mixed ages. Offer well managed crisis accommodation/local support needs for women in crisis, so they do not have to leave friends or pull their children out of local schools etc. Affordable housing in the mix would be desirable. Do not cave in to or let MRC override public opinion or good design with their narrow self interest agenda/s. particularly in providing car parking on race days and other staged events. I wonder where Southwick thinks Carnegie is benefiting “from interim height controls as low as four to five storeys”.